Only 11 days until Leia's second birthday but she already has most of the "2" mannerisms down. She's getting very verbal, both using and understanding far more words than just a week ago. Her favorite word today was "mine" - it's the first time I'd heard her use it, so it was cute; bet that changes pretty quick - followed by "help, help" when she wanted something, like up onto the bed. Leia loves singing songs, especially ones with hand motions like "Pat A Cake". She's usually more involved when she sings, but this time she was distracted by the camera. Leia also loves wood puzzles. She'll play with this one for 30-45 minutes at a time, putting the pieces in, then dumping them out and starting all over again, usually while humming a little tune. We have another one with animals but she's not as fond of that one. 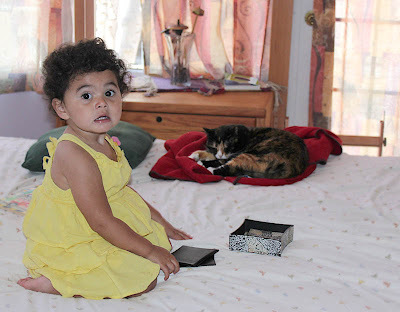 Notice the cat on the bed in the background? Snickers is our 'chicken kitty'; she doesn't care for most people, but especially not noisy little girls. Leia was all over the bed today, playing and singing, and Snickers didn't bat an eye. Pretty cool!